I'll be honest with you. I didn't really develop an appreciation for pink until I was an adult. In fact being an *adamant tomboy I probably overcompensated for it quite a bit. I think around the time I became a mother, when commercials began to make me cry, all small animals found sanctuary in my heart and basically I became a big old softie about the entire world I learned to love pink. Do I think you need to have a kid to appreciate pink? No, I'm not THAT ridiculous. However I think for me, I learned to tap into things of hope and comfort more easily after I did. And that is what pink feels like or represents for me. Hope and comfort. Like the soft light of winter, like an ocean view peering through the fog, like a Jacob's ladder in the middle of a valley. 'Tis the season people, let me get my squishy self on. 'Tis also the season of little people where a lot of happiness and hope is so innocently expressed. A friend of mine just had her first baby. A much anticipated girl. 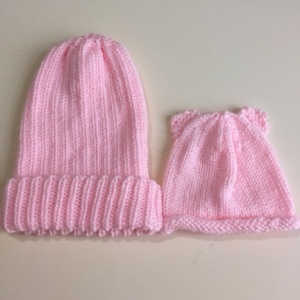 She has been unapologetic in her love of pink preparations for this little one and so I thought ... how about a pink hat? I've been wanting to try this pattern since Kepanie wrote about it. It's baby bear hat and is knit in what I like to call, "brand spanking new baby" size. Sure I could math some gauge out and make a bigger one but why? Obviously the kid will want a pink hipster baby hat, right? I've done this pattern before, but full human size. 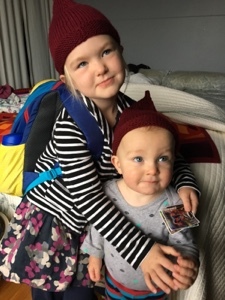 This was another hat I saw Kepanie did for a baby recently and thought, YES! Hipster baby. This Mom is too cool for school, so she gets a baby hip hop dancer hat to boot. *where one must verbally, incessantly remind one's parents when any fashion choices were criticized or suggested including the color pink. Yes I was a handful. I had come home thinking, Now how do I get the rest of it (holiday/work stuff) done? What is the rest of it? 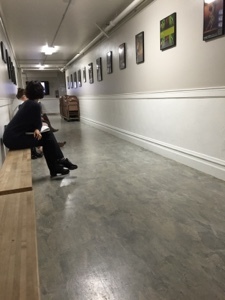 I felt disorganized and the self doubt and the "woe is me" chatter started in the background. (pathetic, but true) and then I opened the mail. 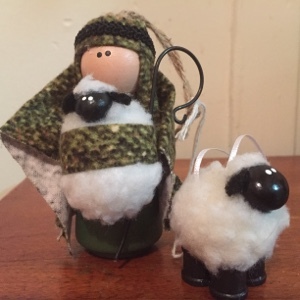 I received not one but two lovely surprises from my Knitter friends for the holidays. The other sweet surprise was from Dee. 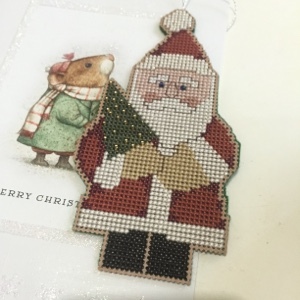 One of her wonderful cross-stitch ornaments! It has joined some of my other favorites on the tree. Look at that Santa! I want to be good and do good just looking at him :) How can you bah humbug looking at that? I was saying the other day that ornaments really help bring out the spirit in me. When The Kid and I open the decoration box and decide what we are going to put on (our tree gets smaller every year) there is a joy that comes over both of us. I love that not only do I have some lovely new ornaments but more stories of friendship as well. I feel just ... happier. The holidays feel fun and not just doable. So thank you again, Kathy and Dee. *My whole family is grateful. *Because I'm not such a pinched up pain in their apostrophes now. What do you mean the weekend is over? Good thing there is another one coming. This weekend I felt like I got a little bit of everything in. The family all farted around together on Friday (Family Friday Fart Around Night ... what this isn't a thing where you live?) and watched a bad movie. 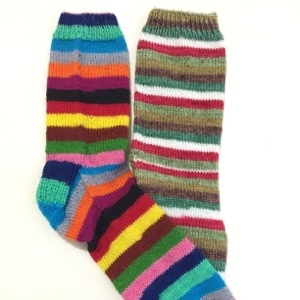 This was not of my choice but I had my sock knitting to keep me occupied to some degree. Regardless I feel like I deserve that hour and half of my life back. No I will not tell you what it was. Saturday The Kid went with the cousins and my husband's parents to see a production of The Little Prince. It was revealed that he is the only cousin who has not read the book, and therefore his "Frenchness" has been downgraded for the time being, ha! Since I was child free for the greater part of the day instead of staying home and doing important stuff that should get done, I got my exercise on. Cardio class in the morning a cup of coffee and then I made my way to an adult ballet class. It's been years since I went to one, but it was good, in that glutton for punishment kind of way. It forced me to stretch a few things that have not been stretched ... in years. Don't worry everyone's got clean underwear and whatnot, I came home and managed some chores. 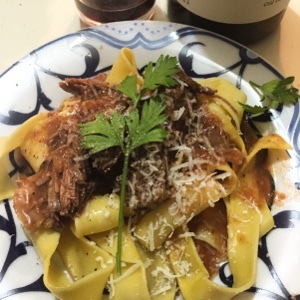 I also tried a new to me slow cooker recipe of Beef Ragu. Martha's bien sur! I really enjoyed it. I opted for the 4 hours on high Saturday Night. then I brought it to a cool, stuck in the fridge, scraped off the congealed fat and then put in on low for an hour and a half the next day. We shredded it with 2 forks and added the red wine vinegar. My parents came over for it for a lovely Sunday supper and we served it with Parpadelle pasta. 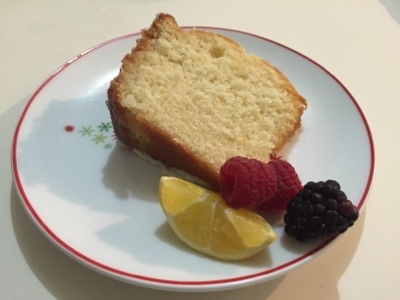 I also tried a glazed lemon bundt cake recipe with half Meyer lemons and half regular (this is a printed recipe so no link :(). This was a big hit. I portioned it out and gave some to my parents and a few of our building neighbors. I'll add this one to the repetoire as well. I had yesterday off and got a temporary crown so now I continue to chew on one side until next year. 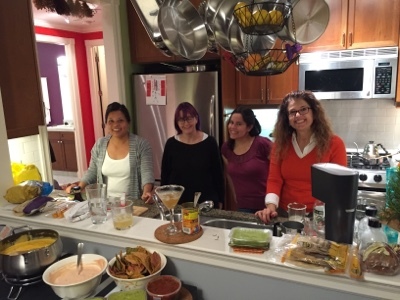 Then we had a knit club birthday chockful of queso and guacamole and bean and cheese quesadillas! Unfortunately birthday girl is taking the picture. Boo! 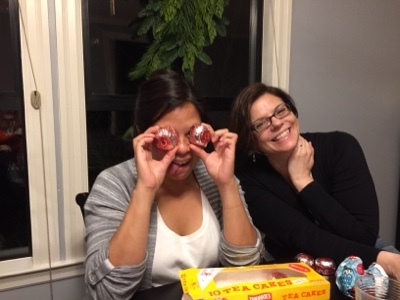 But wait, here she is while I make goofy faces with Tunnocks tea cakes eyeballs, ha! Always fun with that gang. And that my friends was an action packed weekend. Tonight I bake cookies for 41 (I've been hoarding cookie dough in my freezer in anticipation) and I continue to focus on holiday socks. 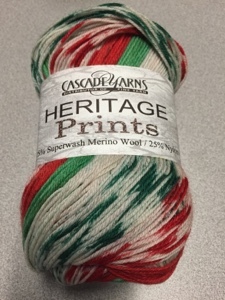 Even my hat plans have moved to the back burner to exact maximum enjoyment from holiday sock yarn. Wishing you good things 'cause that's not just holiday spirit, it's just good spirit. Well if I haven't completely taken hold of the holiday spirit, the sentimental side of me has kicked in. I'm pensive but not completely restless. I'm busy, but not too busy to find some time for escapism. From the author of The One and Only Ivan (which The Kid is still upset I haven't read) is a story of about a Cat friend and what it feels like to have homelessness a factor in one's childhood. The pace can be slow, but it works. I enjoyed listening to this and felt like the narrator captured the imaginative quality of the story very well. It is heart warming and sad at the same time. Be prepared to have a case of the feels. Thumbs up. I know a lot of Knitters have been diving into this book and I have to say I enjoyed it far more than I thought I would've. As hopeless as it made me feel at times I thought the story was very beautiful. I really realize how much I want things to be OK from it. I think I am one of those people in the focus group that wants a happy ending without knowing they want a happy ending. This book makes me think, "quiet strength." I could see this story as it was read aloud. Good stuff. This is the second book in the Heroes of Olympus series. I told you I wasn't that excited about the first book, The Lost Hero. My son assured me it would get better and he was right. 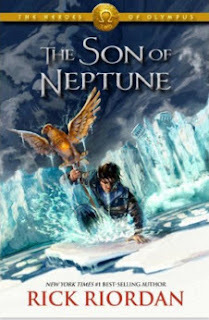 He said The Son of Neptune was his favorite and I see why, it was a much more exciting pace than the previous book and the characters were more likable. We listened in the kitchen a bit doing some test kitchen baking. I thought it was good enough that I will continue checking the audiobook series out from the library. Insert some book here that I stopped in the middle of it, because OMG I could not pay attention. As you can see, it was so memorable I can't even remember the name of the book. Remember there are NOT enough hours in the day to suffer on ... the insufferable. 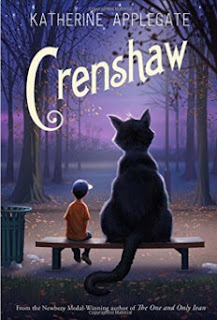 I liked this collection of stories. They weren't as flashy as some of the episodes from PBS but still very enjoyable if you like Agatha Christie. 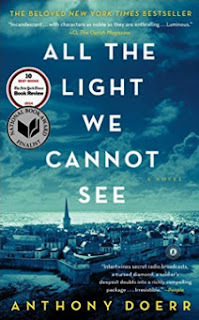 If you are a fan of the PBS shows a huge treat is who this audiobook is narrated by. It's narrated by a bunch of different people! 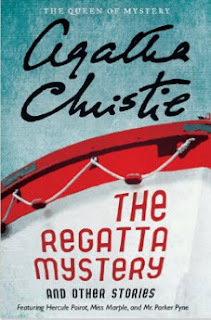 The actors that played Hastings, Hercule Poirot and Ms. Marple herself take turns in a reading, along with another I could not place. Very fun, indeed. I'm currently in the middle of Station Eleven and enjoying it, though I'm at a part that has required a lot of rewinding. The narrative flips in timeline and character. My husband says that it might be easier to follow if reading, but that's a luxury I don't have right now. I have socks to knit. Happy knitting, listening, reading and just about everything else to you. A Case of Second Sock Syndrome? I have been knitting small things as I said I would after the big shawl. However it is the holiday season. Work is a little bonkers. My family is kind of bonkers. So I'm going from one mode to the next ... which apparently includes my sock knitting. In progress, 2 different pairs. Mind the Gap and Gingerbread Socks. I'm currently focusing on finishing the Gingerbread socks because, hello, 'tis the season. Then I'm moving on to more seasonal socks. I'll admit it was a lovely long Thanksgiving weekend. I'm sorry I haven't been able to post sooner, but I was ... doing and having a great time with my family. And this week, well ... I've been working. It's been work to work, if you know what I'm saying. Anyhow, this little man belongs to my friend, W. I was excited when he was having this other Kid, since I am a huge fan of his #1 already. I knit this sweater in anticipation of his arrival and look! His parents actually put him in it! But my friends put them on their kids to show me they fit! 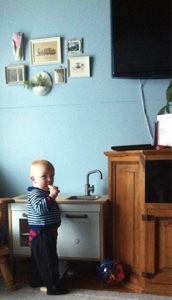 My friends have some cute kids eh? 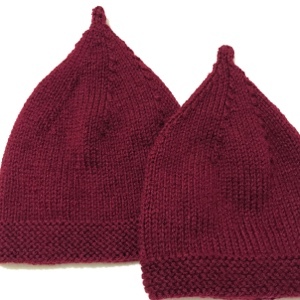 I'm inspired and am now working on a set of pink hats for a different set of new parents. Ahh baby love!